My lovely wife is Brazilian, my mother is Lebanese, my father German. I do all the baking and try my best to share a world's culture with my family. Thank you, Thank you Jane! I'm so glad to know it's not just me! I tried the 1.2.3 formula three times and had almost exactly the results you describe. Too soft, it spread, etc. I do use mostly KA AP, it's not easy to find other, better flours. I get some occasionally. I also found it to be pretty bland. Sometimes I do add rye and it helps. How nice that you got to try the KA AP - and now you know what we're all using. If I'm making enriched breads like challah, everything is fine. Also Susan's sourdough is wonderful made with the flour. I just adjust recipes to suit my taste, but I just couldn't make the 1,2,3 work as a straight formula. ( You're right that I wanted to add more flour, but the finished loaf is too dense.) I think you are suggesting kneading longer. I can try that. It was nice to see your post and that you're back. You always have something great baking. I hope your Holidays were wonderful and Happy New Year! The dough was gloppy, but only at the beginning. Then it REALLY firmed up. So, do try kneading longer. If I remember well, you do all by hand? It would be SO long, or you could do a good autolyse, then knead. I don't know anything about other American flours but I think maybe one general thing is the amound and type of gluten. I think maybe a true French style flour can't be found there! Karl, It's very interesting that you have found the exact same thing... so it's not just crazy me! Mark, I'm all for multi-culturalism and in the kitchen, that's great!!! I use a Kitchen Aid Artisan. I use a Kitchen Aid Artisan. But apparently I need to knead longer. How long would you say it took? Being a highly unscientific and inexact person, I have NO idea. It took way longer than usual. Probably like Steve said in his post below. 10 min? Thanks to you and SteveB for finally doing the flour swap. I'm eager to get Steve's results to compare to yours. From your description I have to think that the American flour protein level may be a relatively poor predictor of gluten content ... or gluten quality (?). Some one with more knowledge of bread science than I will hopefully comment on this. Supposedly, ash content is associated with flavor, but I'm sure it's not that simple. I'm working on writing up my experience with the T65 flour so kindly provided to me by Jane and hope to have it up soon as a blog post. Your gentle reminder is just the kick in the buns (pun definitely intended!) I need. French Organic T65 Flour - Vive la Différence! All during the time I've spent trying to learn how to bake European-style breads, I've heard reference to the differences between French and American flours. Being the inquisitive sort that I am, I vowed that one day I would investigate these differences for myself. The opportunity came sooner than I expected. Jane, the very talented French baker and author of the bog, ...Au Levain!, had a similar desire; in her case it was to have the opportunity to bake with some of the more commonly available American flours. The stage was set... Jane would send me some French Organic T55 and T65 flours and some of her dried sourdough starter (and, much to my delight, an unexpected bag of French sea salt), and I would reciprocate by sending Jane some King Arthur All Purpose and Bread flours, along with some of my dried starter. We would then have the opportunity to attempt to duplicate the baking of each other's breads and compare them to our own. Jane's experience baking with the King Arthur All Purpose flour can be read above. What follows is my admittedly subjective evaluation of the physical properties and baking performance of the organic T65 flour I received. Jane informed me that the flour I received was Biocert Organic Stone Ground T65 flour. Visually, the flour looked quite different than King Arthur All Purpose (KA) flour. The KA flour is an off-white, light cream color. The T65 was also off-white but with more of a light greyish tinge. The T65 also appeared to be a less dense flour than the KA. I don't mean this from a bulk density perspective; instead, the individual flour particles themselves seemed airier. The physical feel of the flours was also markedly different. When I rub a small amount of KA flour between my fingers, it has an almost "slippery" feel to it, akin to talcum powder or graphite but to a lesser extent. Rolling a bit of T65 between my fingers in the same way produces more of a "granular" feel. Perhaps the differences in look and feel are a result of both the higher extraction of the T65 as well as the different methods of milling the flours (i.e., stone-ground for the T65 vs. roller milled for the KA). The difference in aroma between the two flours was also quite noticeable. The KA has a very slight aroma of grain. It doesn't have the strongly sweet smell of some of the other flours I've used, such as the Heartland Mill Organic All Purpose flour. The T65, on the other hand, had a very pronounced earthy, almost clay-like aroma. To test the performance of the T65, I decided to use my standard formula for pain au levain with some key substitutions. I used the T65 in place of both the usual KA and rye flours, Jane's reconstituted starter instead of my own and the French sea salt instead of the table salt I normally use. With the exception of the water, all the ingredients I used were the exact same ones Jane uses for her bread. A quick side note about the French sea salt; it is moist, light grey in color and has a much lighter salt taste than the biting saltiness of U.S. table salt. Upon adding the water to the flour and levain and stirring, the dough came together much quicker than it typically does with the KA flour. That being said, the dough was much wetter and more fluid than dough made with KA flour. After mixing just until the ingredients were incorporated, I let the dough rest for an autolyse period of 30 minutes. Upon removing the dough from the mixing bowl to my work surface, I was pleasantly surprised by the smoothness and high degree of extensibility of the dough. At this point, the salt was added and the dough was hand mixed just until the gluten was moderately developed. With the KA flour, this typically takes anywhere between 6-10 minutes. With the T65 flour, it took only 2 minutes. While baking, the loaf produced a wonderful wheaty aroma that filled the room. In agreement with what Jane experienced, the T65 loaf crust was less glossy than a KA loaf, given the same steam treatment. The flavor of the bread was superb, an incredibly rich, deep wheat taste that I have only been able to approach using KA flour with 5-10% whole wheat flour added. A loaf made with KA flour does achieve a greater volume than a T65 loaf, probably due to the higher gluten content but the lower gluten content T65 gives a more open (and slightly greyer) crumb for a given amount of water. Bottom line? If it were readily available here in the U.S., I would use a French organic T65 flour as my everyday bread flour. I read your description of baking with T65 with ambivalence. You did an outstanding job detailing the behavior of the French flour. The photo of the pain au levain you made with the T65 flour is just stunning. I can't imagine a more perfect crumb or crust for this type of loaf. I'm sold! But I can't just go down to any local market and buy a bag of organic stone-ground T65. What a bummer! You don't have a full chemical analysis of either the T65 or the KAF AP flour, but your description of the tactile difference certainly indicated that the T65 is more coarsely ground. I don't think it's simply a roller versus stone-ground difference, do you? The flavor difference must be due to a combination of wheat variety, terroire and, maybe, aging (?). Seriously, my "stone ground vs. roller milled" comment was meant merely as a possible explanation for why the KA flour has a more "slippery" feel to it. Roller milling tends to flatten the particles, providing a large, flat surface for the particles to slip over one another, similar to how the carbon sheets in graphite behave. Likewise, I invoked the higher extraction of the T65 as a rationale for why the T65 has a light greyish tinge. Volumes could be written on the reasons for the differences between the two flours. My post was merely meant to be a quick overview of my experience with the T65 flour. As for a more exhaustive, scholarly treatment, I'll leave that to those who are more intelligent and so inclined than I. In retrospect, my response to you may have come off as a bit snarky. If so, I apologize. It was not my intent. That'll teach me to try and compose a written response first thing in the morning. Just to clarify: The negative side of my ambivalence had nothing to do with your message. It reflects my frustration with access to seemingly superior flours. Your description of the effect of roller milling does suggest it may explain differences in water absorbtion, at least to me. May I suggest that you and Jane send your write-ups to King Arthur's customer service group for transmission to their test or research groups - they might find it of interest. With a protein content of 12% (greater than their AP flour), it appears as if the flour will behave nothing like the French organic T65 I just described. And as to the flavor (for me, the key characteristic that no specification sheet can capture), that's anyone's guess. Perhaps on my next trip up to KA Flour in VT, I might ask someone in their bakery if I can get my hands on a small amount to try out. In France, they measure Ash and Protein content as a percent (%) of dry matter, whereas in the U.S. the measurements are based on flour with 14% humidity. EXAMPLE: The KA Internet site reveals that their KA Type 65 flour has 12.0% Protein and 0.55% Ash content. I have infinite respect for those bakers who can nail it every time. Certainly protein quantity is an indicator of how flour will perform in bread baking. However it is not the ful range of information that is needed for understanding flour. A high ash content indicates that the flour was primarily milled from the outside of the endosperm. This area of the wheat berry is lower in protein quantity, but higher in the qualities that are needed for free standing bread. Therefore, the higher ash content of the French flour may indicate an increased suitability for the free standing loaves. Similar to the great "Chinese Wheat Gluten" debacle, certain milling operations may more completely mill the grain to get maximum yield and maximum protein to command premium pricing without much concern as to the quality of that protein. Ash content may also impact fermentation rates. There are other indicators of how the flour will act in baking, most notably the results from farinograph testing or alveograph testing. It would be nice if hobby bakers could easily get these results on various flours. One of the problems I experience with my home milled flour is variability. Sure, I can try to mill exactly the same way and I can hope that the results are the same, but without the instruments to really measure some of the characteristics (and some of the equipment is just out of the price range of a hobby miller...) I cannot know. (But I think I've finally saved up for the moisture meter!) That's where the hand and eye come in handy. It's been a while since I really wrapped my mind around flour rheology. Hope this helps. Oh, and forgive my typos - I just got my first pair of real bifocals and they are requiring some adjustment. I thought I could avoid them, but, no. Oh no! I'm going to have to go visit some MILLS now! Ha ha ha! Interesting stuff. Thanks for the low down on your experimenting, Steve. When you do the baguettes with the T55, you have to tell is about it. T55 is more of an all-purpose flour. Anis Bouabsa uses T65 for his famous baguettes, but his T65 is whiter than my T55 and his isn't organic. His baguettes are great, but ones made with the organic T55 is better, both Flo and I think so! My T65 has a higher ash content than a standard T65, that's obvious in the color and the way it handles. I have T65 which is almost white and has less protein than the one talked about here. It's not the same somehow. But since it's sold in a major supermarket chain, even though it's organic stone-ground, I really can't know where it comes from. The Biocert is 100% French grown and ground. T55 is interesting to work with. I use T65 as an All Purpose flour because the T55 is just too fine and light. I always have to adjust the amount of butter and liquid in cake and cookie baking. Also, T65 is "healthier" with it's higher ash content. But I use the T55 when an American recipe calls for AP because it means a white flour and then I just make the adjustments. Recipes I have tried from Mark from BHB and Reinhart work with that flour (Mark's better than Reinhart's may I add). Thanks for your insights, Pat. Hey, I have marrons glacés in my cupboard! Mmmmm cakes, ice cream. I might just try to make some ice cream. Good idea. I'd love to try your home milled bread, I bet it is incredible. I now understand the motivation of so many people in the States that are turning to home milling! Likewise, my home milled can only be properly eaten at my crumbled abode in the Mile High City. But if you are in the neighborhood - drop by! Steve's report that the French flour was more grey than cream is completely consistent with flour having been ground more extensively from the outside of the endosperm. I'm going to see if I can simulate this with my milling and sifting equipment. We should organize a local breads and treats world tour for TFLers. I vote we start at Norm's! Where do I sign up for this tour? Hi Jane, glad you're back! I enjoyed reading your post, with everybody sniffing and tasting and, sadly, no flavor to be found. I'm afraid you're right about a lot of American flour. Especially the non-organic sort which most everybody uses because the organic is so *^$%ed expensive. The lack-of-taste issue is why I never bake any bread with just white flour, and why I now only bake sourdough, unless there's a pressing need. And yes, organic is worth it, if you want really good tasting bread. That said, I have never had any problem with the 1.2.3 formula. I have even changed my levain back to 100% hydration and the dough, made with KA bread flour as a base, is never too wet or too slack. I always use some whole grain flour, which no doubt soaks up some of the water. Also I do a 30-minute autolyse, the "true" kind, as you once suggested to me, and I only machine-mix after that for 2 minutes on medium, and end with 2 minutes of hand kneading. After that, the dough is always very well developed. I'm not a window-pane tester, more of a Hamelman-don't-overoxidize the dough kind of baker. Folding the dough afterward always builds plenty of gluten, with a good rise and similar oven spring. So maybe the whole grain flour is making the difference? Again, thanks for posting your very instructive comparison, Jane. Thanks David, I am on the west coast, and I'll try that! I think this speaks to the issue of terroir - of flavors being local and methods needing to be adapted to local materials. Because I have tended to travel a great deal, I am always intrigued by this. This is why I always qualify my writing with "my dough/my hands/my altitude/etc." The wheat growing and milling traditions must be different in the two countries. After all, we live in a country where my adopted home - the great state of Colorado - is about half the size of the entire country of France (a country for which I also have an undying love.) Things have got to work a little differently here. Climate and soil also have to be considered. You can't grow a crop where it doesn't want to grow. I spent over a year tweaking my baguette formula with different percentages of flour pre-fermented - different hydrations - and on and on until I got the taste that I like. I think that this is the baker's craft. Is it the best in Paris? Well, I don't think so. I don't live in Paris. It might be the best in Denver - although we don't have that kind of competition here - but it is bread that I am pleased to eat. I am forced to ponder that differences in the types of wheat might be why the US has a long tradition of enriched and pan breads, whereas France has a long tradition of lean breads, and more northern climates long traditions of rye breads. I like to eat my imitation baguette, but it will never do anything but remind me of what I can eat in Paris. I think it can never do otherwise and I shouldn't expect it to. It's almost heresy here on these pages, but I do consider that sometimes we "serious home bakers" get caught up in recreating breads from other locations (I'm guilty of it, also...) and forget to explore the richness of our own locale and traditions. Also I cannot help but reflect on "my teacher's" dim opinion of the overnight retard method for baguettes. Again, this person has baked many years with American flours. Could it be that these many years of learning play into that opinion? The flour has, as far as I know, always been the difference between breads in various countries. And as I look into 2009 and form plans for planting, baking, and canning, I am considering being just a little "high prairie" chauvinistic and considering how to celebrate what my high, dry, hard wheat growing locale has to offer. Obviously I think about terroir way too much. But, Jane, thanks as always for providing some valuable food - for thought. Marni, you should try the kneading description of David (Soundman). I'll bet that will work wonders. If you use KA AP, an addition of some rye or ww would bring some flavor. David Snyder, I think you are right. There is something going on there with protein content and real gluten development! I don't think the 10 or 11,5% protein really indicates how the dough is going to handle. Ash content has some to do, but T55, which is a pretty "white" flour, still has way more flavour than the KA AP. Another thing that surprised me that I forgot to mention: the dough wasn't sticky! French flour in a sourdough is VERY sticky and unless the hydration level is really low, it always remains fairly loose, supple and sticky. So, when I see the videos from Mike from the Back home Bakery and the dough is NOT sticky, now I understand! Pat, I'm in total agreement with you. It goes back to our tests with the sourdough with a touch of rye that we all named for our locations. Bread is very individual, not only because of the difference in ingredients, but also the handling, the baking. Great bread can be made anywhere. We're just here to continue this great quest of baking FANTASTIC bread! As for your teacher, I think that must be pretty true. Those french bakers get used to American ingredients... and even tastes! They can introduce some French techniques and ideas, but in the end, they're working with American flours that don't react at all like ours and they have to adapt to that. Plus, if they HAVE to work with a certain brand of flour and say it is marvelous, that influences things, too, I'd say! I sent some salt to Steve as well and I hope he talks about that, too. Even our salt is VERY different! But regardless, as I said, this has been such an incredible learning experience. I still have to decide what to do with the bread flour! I haven't tried it, yet. As a miller, I'm thinking that my goal should be to produce flour that extracts the best from my variety of wheat. I am able to produce an "almost white" flour these days. As I get fitter and fitter from milling more often (I should advertise the "Diamant workout" in some kind of infomercial. Tones the arms, back, and tummy! Provides an areobic workout! ), I really should produce enough of the stuff to see if it has impact on my "white bread" baking. Hmmm. That's a good project to put on my "things to do in 2009" list. I'm also in agreement about French vs American books. I tend to use my French books to inspire me as to shaping and technique, because there is just no point in my beating myself up over not having the right type of flour. Have fun with the salt and bread flour. Bread flour should be quite a difference! What a great, inspiring discussion! Thanks to Jane and Steve for sharing results from their cross-cultural experiment. Bread baking sans frontiers! I'm under the impression that your "typical" American flour is slightly higher in protein content than most European counterparts.Isn't this higher protein content a result of "selective breeding"; American millers or bakers have actively sought flour that are higher in protein, thereby containing more gluten and resulting in larger loaf volumes? The higher protein will affect dough handling (probably soak up more water? ), favoring volume over air pockets in the crumb. 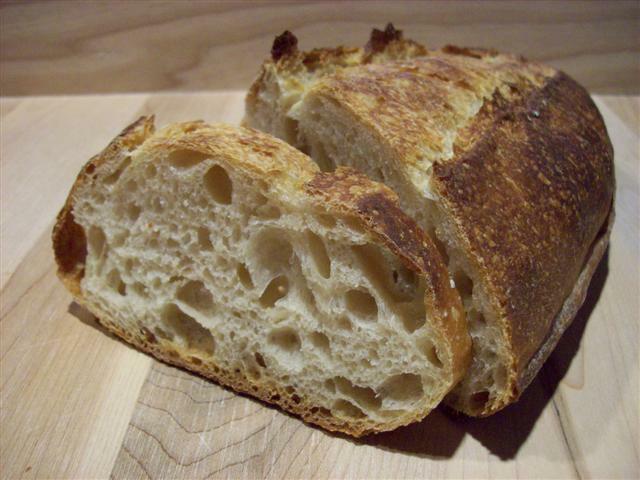 The European counterpart would probably produce a slightly lower bread profile, with a crumb sporting larger, more irregular air pockets. Right? From what I understand, you are correct... American wheat has been selectively bred so that the dough produced from it has greater tolerence (i.e. tougher and more amenable to large-scale machine processing). It follows that a higher protein dough should have less of a flavor potential than a lower protein counterpart. For a given weight of dough and identical hydrations, the lower protein dough would have a correspondingly higher carbohydrate content. The higher carbohydrate content should increase the availabilty of fermentable sugars, producing more flavor. With the exception of the dipeptide aspartame, peptides and proteins generally don't have much of a flavor (try chewing on some vital wheat gluten). One would therefore expect the higher protein content flours (U.S.) to have less of a flavor potential than the lower protein content ones (French). People have been selectivly breeding wheat for centuries. It is a quest for higher yields and suitability to the climate and soil. It is not especially the intention to make higher protein wheat, it is that we find that the high protein wheats are more suited to the climate in large wheat producing areas. When it comes to agriculture, geography is destiny. I see this in my food gardening. I can go to France and buy seeds, bring them home and pamper them to maturity and if I am lucky I get produce that is a pale imitation of what I remember. Some things just weren't meant to grow where I live - even though the frost free season is "about the same" as that in thearea of France where I bought the seeds. It wasn't meant to be. It isn't through lack of will or work. They weren't meant to grow here. I can understand why wheat farmers - who live from the cash their crops produce would gravitate to the varieties that will produce the best. In the Great Plains States, this means hard wheat. The Southern US has a long history of soft wheat - which is why they have a "biscuit based" bread culture. In her book "Animal, Vegetable, Miracle" Barbara Kingsolver laments that she can't get good local wheat so that her husband can bake his "wonderful" bread (which he does 100% in a bread machine - OK...) but she forgets that only soft wheat will grow in her climate. It's all about terroir. OK, but the best French bread is made with soft wheat. Or maybe it's that she wants to duplicate typically American recipes that need higher gluten and she hasn't adopted the conderful baguette! The soft wheat of the Southern US is quite unsuitable for any type of bread making. Trust me. It is only good for quick breads like biscuits - and it makes heavenly biscuits. I would say that French wheat is softer than our North American hard wheats, but not as soft as our soft wheats. I need to do research on wheat varieties in various countries/areas. I started such research a while back, but since I came to the conclusion that no matter what course my future takes I will not be growing my own wheat, I let it drop. Now I am curious, again. When baking baguettes, I almost always use Nancy Silverton's formula based on 100% starter and overnight retardation in the fridge which produces the baguettes we like best with a complex flavor and an excellent crust. I used to make them with KA bread flour but don't anymore as I switched to Whole Foods 365 Organic Unbleached Flour and I am quite happy with both its flavor and the way it handles. I once tried to make these baguettes with KA French-style flour and even though the dough came together like magic and the baguettes almost shaped themselves without any intervention, the resulting loaves were extremely disappointing. They had no taste whatsoever. Because of that experience, I was very curious to taste baguettes made using the same formula but with French flour. My niece Flo Makanai was kind enough to bake some for me using T65 flour last time I visited and they tasted exactly like the ones I make back in the States, which is very interesting as, regardless of the flour, using the same formula and the same method, we got the same results. I didn't expect it to be the case. I watched Flo knead the dough for these baguettes (the video is on my blog at http://www.bombance.net/2008/11/naissance-dune-pte.html) and was surprised to see how quickly it came together (8 to 10 minutes of vigorous hand kneading), an observation which tallies with Steve and Jen's experiences. I made a major (for me) discovery the other day. Water plays a HUGE role in the way a dough handles. I was getting disappointing results at my new house and having adjusted all other factors (including getting a proofbox for these cold winter months), I could only think that the source of the problem might be that we use well water. So we brought in city water (we have a small city apartment) and, bingo ! no need for any adjustment whatsoever. I used Nancy Silverton's proportions straight from the book without changing anything, kneading with my 12-year old Rival mixer and voilà ! the dough came out flexible and smooth, the baguettes shaped easily and were just perfect with a crunchy crust (but then the crust is always crunchy and chewy with levain, isn't it?) and a holey and airy crumb. MC, I totally agree with you that the role of water has been one of the most overlooked factors in dough make up. I'm very interested to hear your results with Flo's 1,2,3 method using city water. I too really like Nancy Silverton's breads. Her La Brea book was what got me started with sourdough more than a decade ago. I made her grape starter (14 days) and am still using it. I have a jar full, which I dried, broke into small pieces and keep in the freezer in the event my main starter goes over the edge. My favorites are her Country White, Rustic Bread and Normandy Rye. Anyway, we live in Florida and the well water here is not good; iron, sulphur, etc. Fortunately we have city water, which is very good quality. FWIW I believe water is key to making good bread and getting good results with any type baking. In my opinion, one can use marginal flour but not marginal water. I haven't run any experiments or tests but I know, from the amount of baking I do, that It makes a big differience as to which kind of water and how it is handled. I filter my water from the fridge through a Culligan filter, then let it sit out for 24 hours before putting it in gallon jugs and storing it in the fridge for use in baking. I haven't had a problem yet. Nancy Silverton's La Brea book is also what got me started on sourdough sometimes between 1994 and 1996, I can't remember exactly. I still use the same starter and it is still going strong. Have you tried George's Seeded Sour from the book? It is incredibly flavorful and we love it. I haven't made the Normandy Rye but I will at the next opportunity. I hope to learn more about the role of water at baking school and I'll be sure to pass on any info that I can glean on the subject. I will also report on any further testing but it will be in a little while as I'll be away from home for the next 4 weeks. Thanks MC. Have fun at baking school. Be sure to tell us all about it when you return...and take some pictures at the classes and post them, please. Oh my!!!! 7,50 for a 3lbs bag????? That's insane! I've been paying around 1 - 1€50 max for a kilo of stone ground organic T55 or T65. I don't think I'd even bake at that price. Unhappliy, it's even worse than that: $9.95 for 3 lbs for what they call French style flour. The $7.50 price is for European Artisan flour. I doubt that either of these is a big seller. Our cheapest flour (non-organic, bleached, from Costco) in 25 lb bags is about $0.40 per pound, KA AP is about $1.25 per pound in small quantities. I don't have prices for the WF 365 flour, but I'm guessing that it would be in the $1.50/lb range. Based on Flo's aunt's comment, that's my next stop. I had a bag of the KA Artisan flour in my refrigerator so last weekend I used it for the Bouabsa baguettes. The crust was softer and the crumb less open than my bakes using KA bread flour. So was the taste. I'll have to admit that in the past year, my only use of AP flour has been for cookies and such. My first try on the Bouabsa baguettes was taken from David's ficelle blog - he used Giusto's Baker's Choice, which is milled from hard red winter wheat - as is the KA bread flour (nonorganic, though). I've continued to use bread flour for these baguettes because the results are great. I'm interested in hearing Jane's verdict on the KA bread flour. The discussion about the taste difference of organic flour is also quite interesting. Such flour is not offered in our local stores, but my cyberspace travels have turned up Eden organic flours which, remarkably, are milled in Michigan. Does anyone from TFL have experience with these flours? "...it was SHINY and smooth crusted. It looked plastic." for sharing your experiments/tests. Interesting, well done and appreciated. OK, my question is...why is there no French flour (T-55, T65, etc.) available in the U.S.? I have it on good authority (Rick Blaine owner of Cafe Americain in Casablanca) that the missing flour is attributable to a clandestine plot by the USDA hatched by Archer, Daniels, Midland, aided and abetted by Con Agra and Major Strasser. Where I live (Northeast of the United States), WF 365 Organic Unbleached Flour is often cheaper than KA Unbleached All-Purpose Flour. I can't give you the exact figures because I don't have them off the top of my head, because they do vary from store to store (the best prices on KA flours are to be found at Walmart) and because Whole Foods sometimes runs specials during which I stock up. It is sold in 5lb-bags. This topic has got me thinking about the fields where the grain grows. I've observed that the farms and fields are smaller in Europe than those in the US. The smaller fields are also near and in close contact to woods, orchards, and hay fields of flowers in comparison to the large roaming seas of wheat fields typical to North America. I can't help but wonder if the variety of microflora on the grain may have a lot to do with the flavor and if there are more varieties in smaller fields than larger ones. I wonder how soil compositions compare as well. Wheat varieities, micro climates, macro climates, trace elements, daytime temperatures vs night-time temperatures, fertilizing practices, cultivation practices, and so on - it all makes a difference. I've studied this stuff quite a bit and it can be overwhelming. It's like bread - everything must be perfect. As I said in another post, I can buy seeds from French producers and "in theory" I should be able to get the same results. But I can't. And on a large scale the effort that I put into some things would be impossible. Terroir, terroir, terroir. We are captive to geography when we talk agriculture. Even the emergence of California as producing wines that are consistently "better" than their French counterparts speaks to this. The know-how can be moved around the world - the soil and climate - not so much so. Some French varieties do "better" in California. Sure we can ship flour around the world. It is part of the incredible luxury that the 21st century has provided developed nations. But as (apologies California) Champagne is only produced in a specific region in a specific country, French flour will ever remain French. ...now if Steve would just share some of that flour. I enjoyed reading both experiences. Makes me wish I could try European flours. I'm with dmsnyder on the frustration thing. Maybe TFL needs to create a CO-OP to import Euro-Flour in bulk to share among its denizens? A question for Jane: Do you bake rye breads at all? John, I would if I could. As Jane mentioned, it was extremely expensive for us to send flour to each other, allowing us to send only small quantites. A couple of loaves and the flour was gone. Yes, I do and baking ryes was what took all dough fear out of me! All my ideas of what dough should feel like changed and now I really love high hydration doughs and "difficult to work with" doughs. Why do you ask? All this talk about French/American flour differences and their effects on baguettes is extremely interesting for me to read. It also causes me wonder about other breads and flours. My nascent adventures into bread baking were born in a longing for the European ryes and pumpernickels I remember from traveling around the Continent - a longing likely handed down in my lowly Germanic genes as well. While I would think neither rye nor pumpernickel breads are as sensitive to flour differences as the subtle tang of baguettes, I now grow more curious whether European rye flours more piquant than the American versions. I have no idea! The ryes I see on this site always look the same as over here and since it's a flour that has probably undergone less "manipulation" maybe it remains pretty much the same. But that's just guessing.